Born in Berlin, the famous English portrait painter Lucian Freud (1922-2011) is the grandson of the founder of psychoanalysis. Fleeing Nazi Germany, his father brought him to London in 1933 and he became a British citizen in 1939. His vocation became apparent on leaving school. He studied painting at the Central School of Arts and Crafts and then at Goldsmiths College in London. He then had a brief flirtation with surrealism. Initial recognition came quickly in 1951 when he was awarded the Arts Council prize for the Festival of Britain. In 1987-88, a travelling exhibition of his works in Washington, Paris, London and Berlin confirmed his place at the forefront of contemporary figurative realism and, in 1995, the exhibition devoted to him and his friend and fellow-painter Francis Bacon at the Fondation Maeght in Saint-Paul de Vence underlined his provocative power and his vision of the human body marked by time and the world’s violence. His surprising depiction of Queen Elizabeth II in 2001 scorned the conventions of ceremonial portraiture. In 2008, one of his works was sold for the highest price ever attained by a living artist. Lucian Freud is first and foremost a painter of flesh. Nacreous, marbled, disposed in precise and vigorous volumes, it gives their expressive power to nudes and battered faces, at once alive and set in an almost corpse-like stiffness. 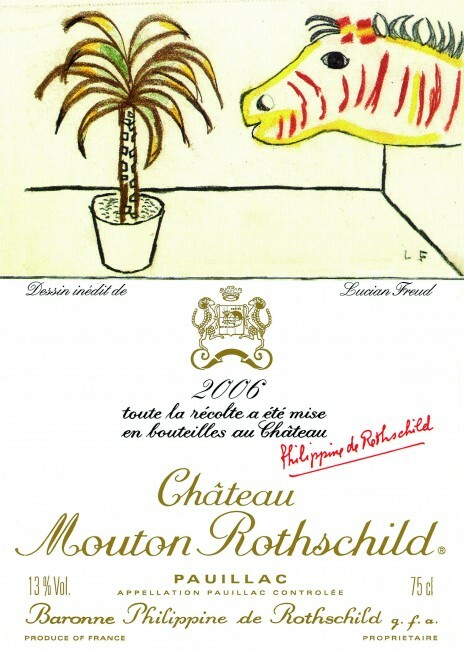 Far from the tormented portraits and nudes for which he is renowned, for Mouton 2006 Lucian Freud has chosen a joyously exotic transposition of the pleasure of drinking, in which the vinestock is transformed into a springing palm tree and the winelover into a happily anticipatory zebra.